We Can Fix Your Lawn! Are you so frustrated with your lawn that you’re ready to cement the whole thing over and paint it green? Hi, I’m Skip Orth, owner of Father and Son Pest and Lawn Solutions. I’ve been solving lawn problems for homeowners right here along the Emerald Coast for over 25 years. 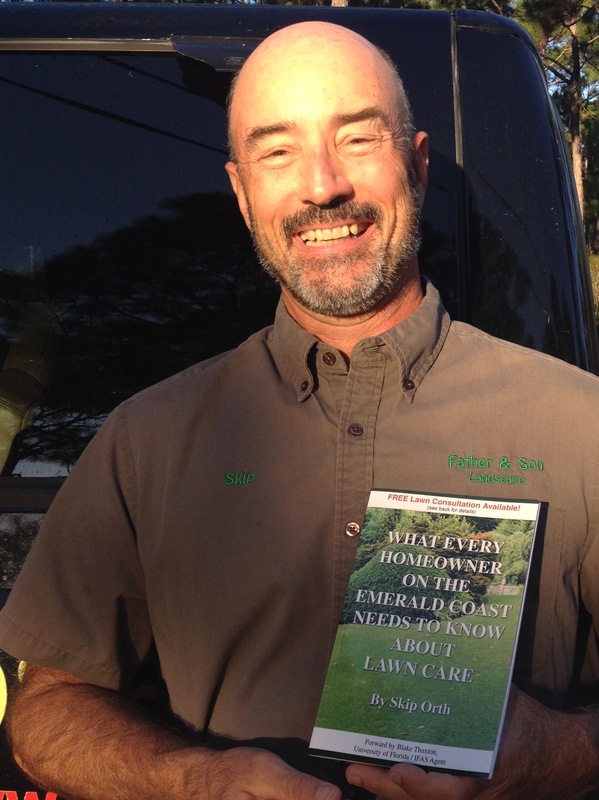 The Emerald Coast is one of the most difficult areas in the entire country to keep a lawn healthy! Our sandy, nutrition deprived soil is very poor. Certain weeds we have here along the Emerald Coast are so aggressive they will choke out an otherwise healthy lawn. Our sub tropical climate is ideal for a variety of insects and diseases that attack and destroy lawns. As well as, inconsistent rainfall requires ever changing irrigation requirements and specialized knowledge of sprinkler systems. All these challenges put together, require quite a bit of expertise to keep a lawn healthy over the long run! Because of my experience in dealing with all of these challenges, working on literally thousands and thousands of lawns over time, I’ve discovered the best methods and materials to meet the the challenges we face along the Emerald Coast when it comes to keeping grass healthy. I am very intentional about passing my knowledge and expertise down to my staff. Environmental conditions constantly fluctuate through the year affecting lawns in a variety of ways such as disease, pest activity and drought stress. Several times a week our technicians and I will meet first thing in the morning and discuss what is affecting lawns at this time and how to modify our treatments and procedures to meet the conditions we face. We don’t take a “one size fits all” approach with our service. Each lawn we service varies in grass type, shade, density and soil conditions just to name a few. Each of our service vehicles carries a variety of products and application equipment to treat the variety of lawn needs we encounter every day. Our service crews consist of 2 members. I know from personal experience you can get worn out pretty fast treating lawns on a hot July day. Having two technicians per crew spreads out the workload and enables them to provide better service over all. We offer a variety of maintenance programs designed to provide your lawn and landscape with everything needed to keep it healthy! See our Services page for a comprehensive listing of our recurring service packages and our individual (a-la-carte) services available to suit your maintenance needs. Please contact us for a free lawn consultation. We will assess your lawn and discuss with you what it needs to restore it and keep it healthy. Many lawn problems cannot be solved with treatments alone so we will also take the opportunity to inform you about what else you can do that will enhance the service we provide. Their service is great! They are always prompt to attend to any concerns we've had. Our yard has never looked better! Very nice and prompt. Fair price for pest control treatment. I would definitely recommend them. This company is A++++ They turned my lawn of dirt into a lush lawn again. Thank you!!!! My lawn looks great thanks to father and son! These guys are awesome. Keep up the good work. Hands down the best in the area. Keeping in mind that grass isn't even supposed to grow in our are(research it) and that you can't please everyone(especially those who are unaware of certain facts), this man's company is leaps and bounds ahead of others like TruGreen. You get what you pay for, like everything of course, and Skip is the best. If you're looking for the best lawn care specialist then these are the guys to have. All of them are extremely professional and actually take pride in what they do. I didn't catch the name of the 2 gentlemen that sprayed the first time but I've never had a lawn service so polite that they seem to actually enjoy what they do. I hired them this season to get my grass looking good for the summer and I'm glad I did. I had a bunch of weeds after putting sod down last year. I had tried weed killers from Lowe's and the dollar weeds just laughed at me and got worse. So I finally decided to call and see how well they could handle it (I honestly didn't have high hopes that anyone could kill them before summer). Well after their 1st spray the very next day the damn things were already yellow and dying. By the time they came the following week my grass looked amazing and dollar free. They do such a good job my mom & dad, brother and grandparents all have them now. So if your tired of throwing money away with Tru green and other ones I highly recommend giving Father and Son a try. Perfect example of a business owner that truly cares about his clients. 5 stars isn't enough. My yard hasn't been cared for in a couple of years and was in terrible shape. I had several other lawn companies come out and they all said it couldn't be saved and that I would need all new sod. Skip was recommended to me by a couple of people so I called him and he came out to give me an estimate on laying new sod. Which would of cost several thousand dollars. After checking my lawn he explained that he could save my grass if I follow his watering instructions. My yard looks so much better and it's only been a few months. I was ready to drop several thousand dollars but Skips honesty and knowledge kept that from happening! Huge Father and Son Landscaping fan! Highly recommended local lawn care and maintenance experts. Skip and his technicians are the best in the area to keep your lawn healthy. They also provide FREE lawn consultation. I have had Father and Son for many years and I am thoroughly pleased with there services and results. I have had people stop me outside and ask me who I use because my lawn looks great. I couldn't be more pleased and highly recommend them. Living in Florida brings a constant struggle to maintaining a beautiful yard year round. We moved into our new home and we determined to care for it ourselves. Well- it didn't take long for the mole crickets, fungus, and creepy crawly pests to arrive and ruin our beautiful new yard. We interviewed a few lawn control companies (and have used quite a few others in the past and were dissatisfied) - and chose Father and Son Landscaping. They did such a great job bringing our lawn back to life. They manage our sprinkler system, bushes, and grass. I love driving home and admiring our beautiful, healthy grass and shrubs!!! This is a great company and I love the guys that visit our home every month. They are also very respectful of my dog and make sure that I know when they arrive! Thank you Father and Son!!! Why not make have the best looking yard in the neighborhood? Give us a call at 850-939-9868 and we will be happy to meet with you, do a walk-through of your lawn and discuss the issues you are having. We will make sure you have a lawn that you're proud to call yours!